Over several years, Capitol Hill School worked with a landscape architect (Galdón Studios) to complete a design, and then fundraised for the transformation of their entire schoolyard. This project included a pilot project for CBE’s first geodesic dome greenhouse. In planning the installation, we realized the opportunity to adjust the style and placement of several key elements to gain the most benefit from them. These changes were approved by the school and set the stage for a high quality installation. We also completed detailed design for a food forest area on the school grounds. The installation took place in the fall of 2017, and many of the elements were located in high traffic areas, so safety was the utmost priority. Due to a comprehensive safety plan, and cooperation from all users of the site, the installation happened smoothly and safely. The first phase of installation included the transformation of the entire schoolyard area. 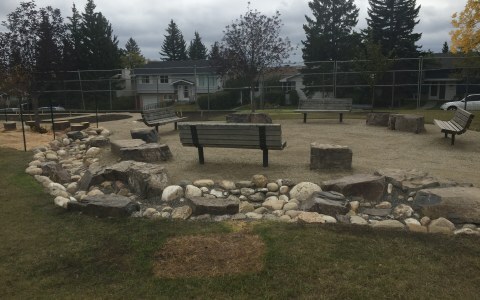 Two formal outdoor classrooms were constructed from Rundle boulders surrounded by perennial planting areas. Three large grass berms with mulched basin planting areas were added between the existing playground and playing fields, with additional concrete pads for several picnic tables and benches to enjoy the area. The rear of the school was enhanced with the removal of asphalt and the addition of a large grass area and trees near the existing playground, along with a vegetated water harvesting swale to address water and ice issues. 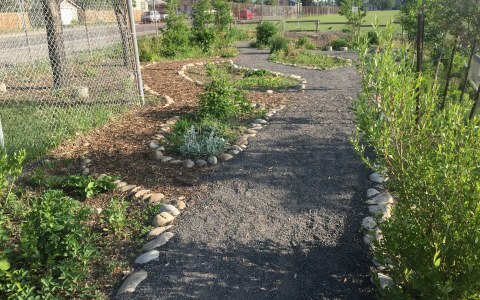 A food forest was planted at the far east end of the playing fields, with mulched basins to collect rainwater and large boulders to provide a place to rest. Overall, the project added 80 trees, 70 shrubs, and many perennials to the school grounds. The courtyard area was prepared for the geodesic greenhouse, including cutting and removal of existing asphalt, installing a level crushed Rundle surface, and contracting the installation of a 10-foot tall chain-link fence. For the second phase, we were hired in early 2018 to install interior garden beds and soil for the geodesic greenhouse that was installed on site by the parent council in the fall of 2017. There was a desire to have growing space for all grades, including a hydroponics bed filled entirely with water, in an space that was accessible. The interior garden beds were made from metal livestock troughs to ensure there were no concerns with affecting the structure of the greenhouse, and to provide the possibility of being portable if needed in the future. After construction was finished on this entire schoolyard naturalization, the space was utilized immediately, and there is much excitement about all of the new elements of the naturalization. 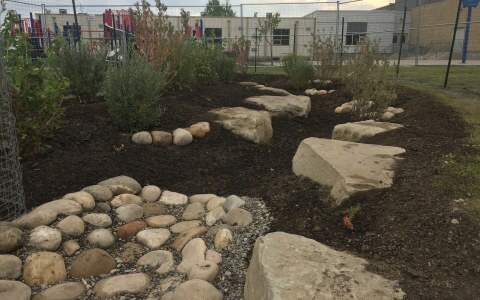 The school grounds have been revitalized with areas of interest that can be experienced throughout by students and teachers, and also the broader community. The addition of trees and grassy areas to run around the playground have softened the rear facade of the school and made it much more inviting. The berms and planting areas with boulders add visual interest to a mostly flat schoolyard, and are a wonderful active play feature. Picnic tables and benches provide a place to rest and relax and often fill up at recess, lunch, and after school. The outdoors classrooms offer two areas where teachers can hold classes in an outdoor setting, and the food forest is establishing well and will provide an opportunity to teach students about growing and harvesting perennial fruit that is adapted to our climate. Students at the school have been engaged in garden education inside the geodesic dome greenhouse ever since the completion of the installation. When we visited the greenhouse in June of 2018, just a few months after the installation of the interior garden beds, the greenhouse was bursting with life with plants and vines growing up to the ceiling! With the help of dedicated teachers who are programming the space, students are getting the chance to amend soils, grow a variety of plants using different methods, observe the benefits for growing plants by the enhanced microclimate in the greenhouse, and learn about weather through monitoring several weather stations on site.